What defines a robot? Lately I have had many discussions with my nephew about robots. He is going through a robot loving phase of his childhood. We’ve spent countless hours on the phone talking about the CNC machine and 3D printer. Both of these are “robots” in essence. When he first saw pictures of the 3D printer his comment was, it did not look like a robot at all and therefore was not a robot. We then had a lengthy discussion about what makes something as a robot. Hard to argue with those definitions. Which brings us to the project part of this post, the 4M Tin Can Robot by Toy Smith. 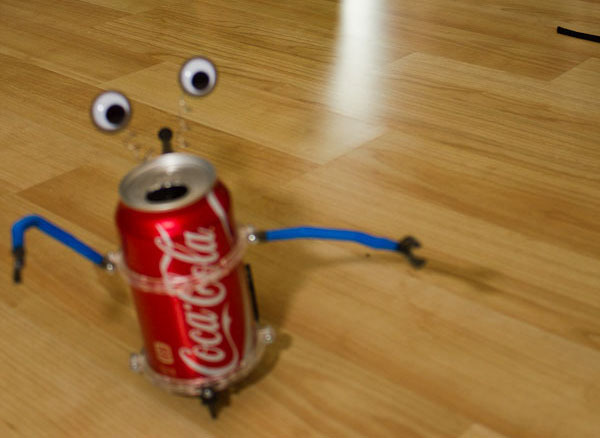 This little project was fun to build, but is it really a robot? Does walking forward in a straight line make it a robot? We concluded that because it is a toy robot, it is indeed a robot but it was not a real robot because it did not actually perform any task and was not controlled. That being said, it is a great project for a young robot lover. 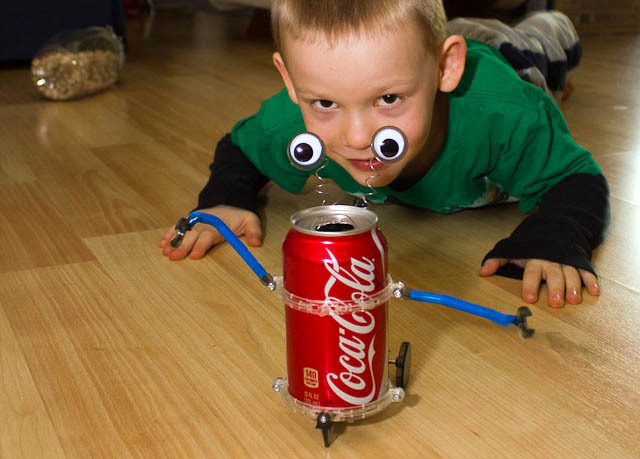 My nephew built the Tin Can Robot Kit almost entirely by himself under some close Uncle Zac supervision. Above you see the Tin Can Robot in the box. It comes in a rather large box considering what is inside. The parts are packaged in small plastic bags and the instruction sheet in the box was easy to follow. It does not come with the two AA batteries you need to have real robot action once it is assembled. 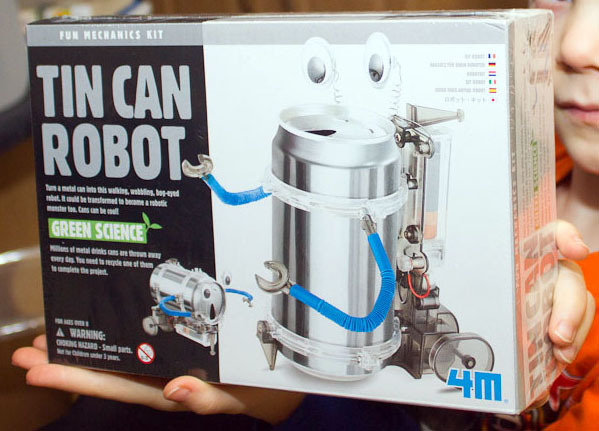 Be sure to have them handy for the build so you can see the Tin Can Robot come to life upon completion. If you want to purchase one of these great kits you can find them available here. 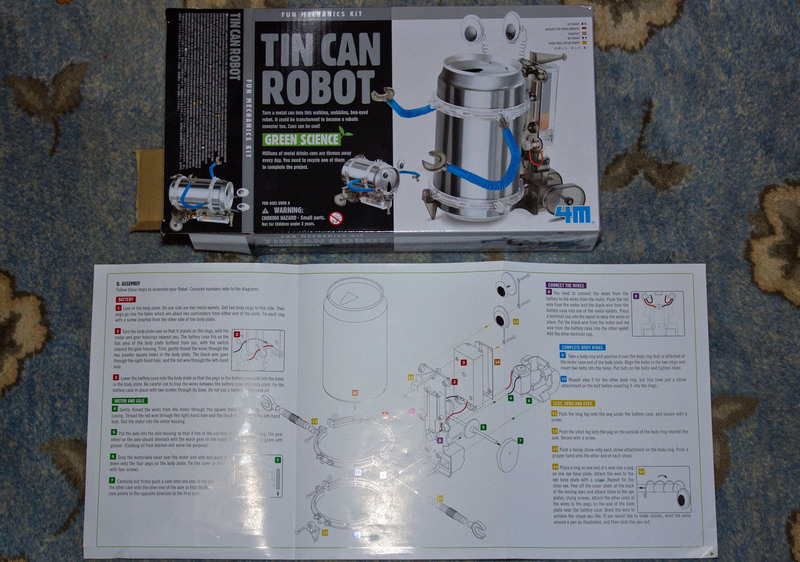 The assembly instructions for the Tin Can Robot are clearly illustrated (click on the above image for legible full size image if you lost your instructions or need to reference the Tin Can Robot instructions). The only part I helped my nephew with directly was the insertion of the wires into small brass rivets with little plastic plugs. It required a fair bit of force and my nephew was not capable of pushing the plastic plugs into the rivets. There are a lot of small screws in this kit. It’s best to open the parts bags over a tray or bin of some sort to keep them from getting lost on the floor. Because the screws are small, my nephew was capable of screwing each one in with a small screwdriver on his own. The Tin Can Robot sits in a special place on a shelf proudly displayed by my nephew when not in use. It was a great project for and both of us had lots of fun both building and playing with this toy robot kit.